Review: The celebrated art and design agency is more than the sum of its client work, as this second volume of projects proves. 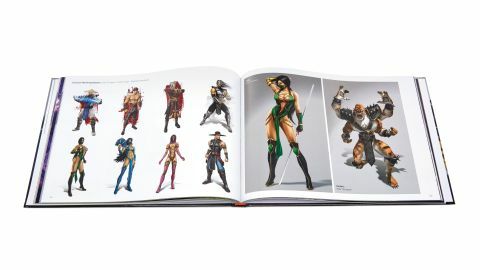 The Art of Atomhawk delivers more than your standard Kickstarter book, stuffed with a wide portfolio of work and useful tutorials. Great for all artists, not just gamers. We’re long-time fans of Atomhawk, the digital art and design agency based in Gateshead, north-east England, that rose from the ashes of Midway Games UK in 2009. Fast-forward to 2016, and the company has 40 released projects to its name across games, films and digital media, including Mortal Kombat, Project Spark, Injustice: Gods Among Us and JK Rowling’s Pottermore. So this Kickstarter-funded volume of its concept art work is well overdue. Environment art by Pete Thompson, created for the PS Vita first-person shooter Killzone: Mercenary. However, the book is at pains to convey that Atomhawk is far more than just the sum of its client work. To hammer the point home, it opens with a ‘Meet the Team’ section, featuring shots of employees at work in the studio and letting their hair down on group days out. These pages might have come across as self-involved, but instead reveals that Atomhawk isn’t just a pay cheque for its employees, but a real community of artists. Continuing the theme comes a chapter on an internal Atomhawk project, The Realm. This game was developed to hone the team’s creative wits and act as a portfolio piece. Although the crowdfunding campaign to make The Realm was unsuccessful, the concept art is proudly reproduced here; a sign that aesthetic achievements are at least as important as commercial ones for Atomhawk. We’re particularly enamoured by the creature work in this section, from Charlie Bowater’s strange stone monster Toru to Robert F Castro’s tall and terrifying Lampheads. The challenge for Charlie Bowater was to portray the lead character from The Realm at the right age. Next comes the client work, which is varied as it is breathtakingly inspiring. From new versions of Wonder Woman and The Joker for Injustice: Gods Among Us to building and boat designs for Killzone: Mercenary, the art is complemented by insights into the thinking and influences behind it, along with some handy digital painting tips. And that’s not all. There are also five in-depth tutorials sharing the The challenge for Charlie Bowater was to portray the lead character from The Realm at the right age. techniques, workflow and inspiration that Atomhawk’s artists use when creating concept art. Furthermore, eight of these artists have included selections of their personal creations, along with advice on how they develop their skills through their own work. We’re generally a little wary of Kickstarter-funded books, which can be hit and miss. But in our eyes, this one is very much a hit.